There has been a recent flurry of new budget smartphones hitting the market with sub-£150 SIM free or sub-£10 per month contract pricing. One of the very newest of these is the HTC Desire 530 and today we take a close look to see if this smartphone is the one get in the first half of 2016. The Desire 530 feels good in the hand and this is due to three things.The phone has a soft touch rear case, it is almost weightless at 140 grams and at 8mm thick it is easy to clasp hold of. The large camera lens cover on the back of the phone looks expensive while on the front there is very little space that isn’t screen. The headphone port sits on the top of the phone while the charging port is on the bottom. On the side there is a rocker volume key and, on the model we have, the orange power/wake key contrasts the black body with a matte orange colouring. This button is also textured with several ridges and this makes it easy to distinguish from the volume keys, by touch alone. The Desire 530 has a 5-inch display and this means that the overall size of the phone is just right. Super LCD technology makes the visuals bright and vivid, and in a line up with Apple and Samsung phones, the Desire 530 is just as bright. 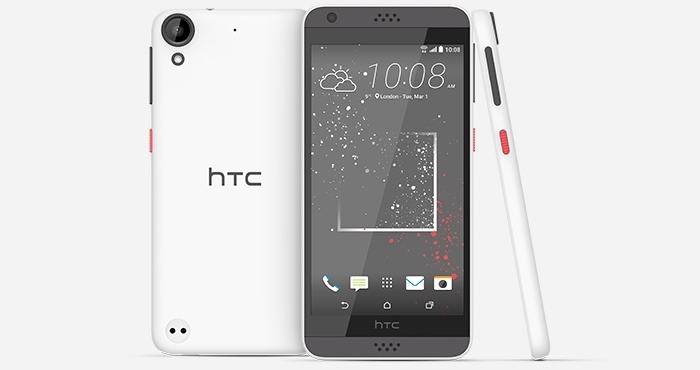 The OS is Android Marshmallow but HTC has tweaked the overall look with its own user interface. On the home screen there is a clock, date and weather widget and underneath this there is a grid of apps. Immediately we notice that this grid of apps has a title and touching this opens a drop down menu. This is HTC Sense. This location based innovation knows where you are and it adjusts the apps displayed on the home screen to suit this. HTC Sense has three set ups; one for home, another for work and a final set up for generally out. You can either leave the phone to decide which apps are appropriate for each location or customise each of the setups yourself. A swipe to the right drags in the HTC Blinkfeed screen and this can be set up to display social media updates and news headlines, of which you can select topics of personal interest. A swipe to the left drags in another page of apps and you favourites can be pinned here so that they are easily at hand. HTC is one of the best smartphone brands to choose if you like to customise the look. The Themes app opens up a store full of free themes that can be downloaded in seconds. It is possible to pick a new theme that will include a wallpaper, new icons and sounds. You can also download single elements so you can get a new background without changing the existing icons if you like them. There are other options to explore and one of these that stands out is the Android feature called Daydream. Daydream gives an almost always-on display type service and can be activated manually or triggered to Daydream when the charger is connected. Daydream will then show a choice of information such as the time and weather, or a slideshow of captured photos. The service is infinitely flexible with Daydream apps in the Google Play store, which let you customise what is shown on the Daydream screen. The combination of cameras is good with a main 8MP camera and a 5MP selfie camera. Switching between standard, panorama or selflie shooting modes is easy and performed by swiping left or right. On screen there is a shutter button and a record button, so there is no messing around when you need to capture a spontaneous moment. Aiding photography is HDR and this can be used when scenes have dark and light in them. This is normally a challenge for cameras and HDR overcomes this by snapping two images at different exposures and merging the best bits of each to form one photo. There are plenty of other features, including those for editing photos after the event. HTC Zoe is also and board and this feature can automatically use the photos captured to create slideshows with transition effects and music. Should I buy the HTC Desire 530? Absolutely, with the latest version of Android, good cameras, a bright screen and HTC customisation, this is a budget friendly handset that will not disappoint.